He also created Captain Scarlet and the Mysterons and his puppet superheroes fired the imaginations of millions of young viewers in the 1960s and '70s. Thunderbirds, a science-fiction fantasy about a daring space rescue squad, ran from 1965 and was his most famous show. Jamie Anderson announced the news on his website, saying his father died peacefully in his sleep at noon on Wednesday. "Gerry was diagnosed with mixed dementia two years ago and his condition worsened quite dramatically over the past six months," he wrote.Gerry Anderson talked about the onset of the disease in June 2012. Speaking on BBC Berkshire he said: "I don't think I realised at all. It was my wife Mary who began to notice that I would do something quite daft like putting the kettle in the sink and waiting for it to boil." His other creations included UFO, Space: 1999, Supercar and Fireball XL5. Actor Brian Blessed, who worked with Anderson on shows including The Day After Tomorrow and Space 1999, told BBC News: "I think a light has gone out in the universe. Anderson, who lived in Henley-on-Thames, Oxfordshire, began his career studying fibrous plastering, but had to give it up when it gave him dermatitis. Speaking in January 2011, Gerry Anderson said he felt "humbled" by his success. After a spell in photographic portrait work, a job in Gainsborough films and time spent in air traffic control, he set up AP Films with some friends. Commissions were few, however, so he responded eagerly to the opportunity to make a puppet series called The Adventures of Twizzle in 1956. It was nine years before Thunderbirds came into being on ITV. The action was filmed on Slough Trading Estate in Berkshire. This is terribly sad . 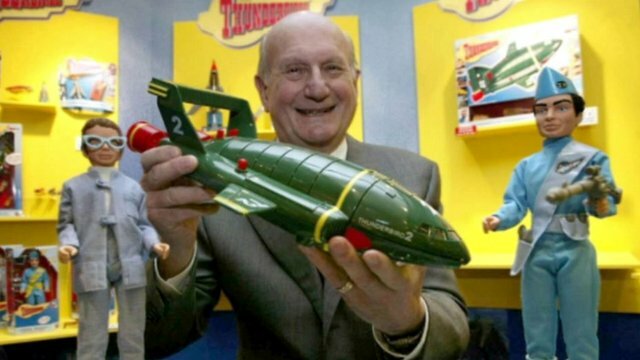 Gerry Anderson was so important to me growing up in the 60's. He was the British Walt Disney and should have received a knighthood for services to children's television. RIP - FAB.